This year we have two Fellows in the program whose siblings also participated in the past. We are excited to share with you stories from Year Two Alumnus Roy Yewah and his Fellow sister Kristelle Yewah, and Year Five Alumna Rachael Aptowitz and her Fellow sister Jocelyn Aptowitz. Since their Fellowship years, Roy has gone to pursue his MBA at University of Michigan and also worked at Ford Motor Company being recognized as one of their top 30 in their 30s. Rachael has continued to work at host company General Motors and has been featured as one of their leading young female engineers. Read on about these amazing alumni and how their siblings are following in their footsteps as Fellows, while also impacting Detroit as individuals. QUESTION: Rachael and Roy, you were Fellow in our fifth and second years respectively, please share highlights of your fellowship year such as a favorite project or experience. RACHAEL: My favorite part of my fellowship year was definitely working on my impact project with Beaumont Family Medicine. Another fellow, Poonam Narotam, and I worked in partnership with Dr. Asha Shajahan to carry forward our cohort’s 4th Challenge Project, centered on using art as a medium to promote healthy communities. Poonam and I designed and built pedal powered machines that Detroit residents used to create art to decorate Beaumont clinics in their communities. I was most excited about putting my mechanical engineering skillset from my Monday-Thursday role at General Motors to direct use on Challenge Fridays. We even presented our Active ART project at the DIA and the Innovations in Health Care Awards in the months following the official end of our fellowship year. ROY: My favorite parts were 1) the networking opportunities afforded to me from being a fellow, 2) being part of the change occurring within the city right after it filed for bankruptcy, 3) developing a strategy to help 826 Michigan open its Detroit office, which they officially opened in November 2015, and 4) meeting my current girlfriend of five years within the program. QUESTION: Jocelyn and Kristelle, you are current Fellows. Please talk about the learnings you have experienced and the contributions you have made to the program and Detroit so far. 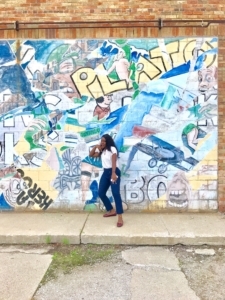 Kristelle poses in front of one of Detroit’s many murals. 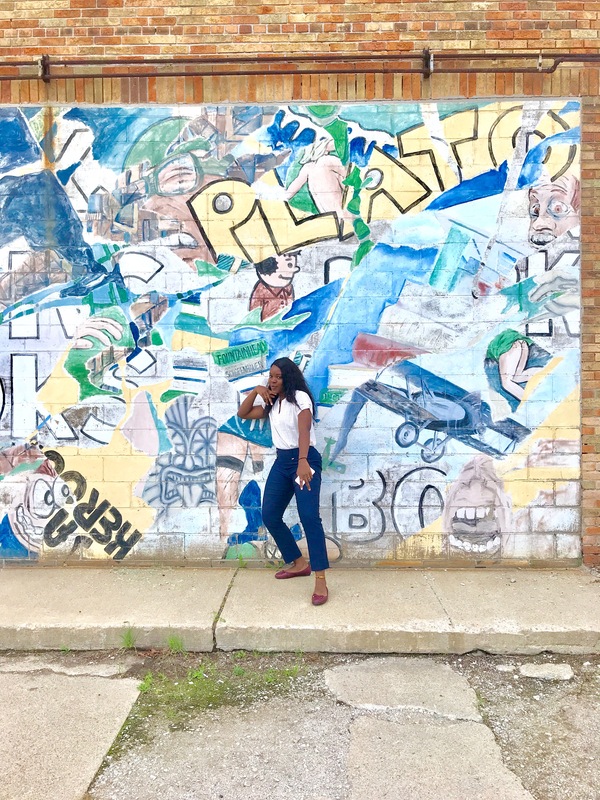 JOCELYN: It’s hard to believe that I am already over halfway through my fellowship year with Challenge Detroit! The program has been such an amazing experience in learning not just about the nonprofits we have collaborated with as a cohort, but all about the city of Detroit and using design thinking to make a positive impact in the community. My favorite experience so far has been that my host company, Michigan Opera Theatre, was also a Challenge Project partner. I had the unique opportunity to both work on the project as a fellow and collaborate behind the scenes with Shelley at Challenge and my MOT coworkers. The amount of passion and consideration that goes into creating projects that will be impactful for the nonprofit and a meaningful work experience for the fellows is staggering. And in the end, the amazing work done by my peers is being utilized at MOT and I get to continue to implement their recommendations. KRISTELLE: It is crazy to think that we are more than halfway done with this fellowship. I have enjoyed learning so much about the history of Detroit, especially within each of the neighborhoods. As far as contributions to the program, we are on our 3rd challenge and so far we have worked with the Eastside Community Network, Hannan Center, and are currently working with Century Forward. I enjoyed being a part of the rebranding of the Mack Avenue Corridor as it used to be such a vibrant street and I know the community would like it to get back to that. I also enjoyed working with the Hannan Center and finding ways to make the building more physically accessible to older adults so that they could feel welcomed. QUESTION: Rachael, since graduating the program you have continued to work at GM and volunteer to support young women in robotics. Tell us about your career and volunteerism, and how you continue to carry what you learned during your fellowship in your work today. RACHAEL: During my fellowship year I was a part of the post graduate TRACK engineering rotational program at General Motors. Since graduating from both Challenge Detroit and TRACK I have continued to work at GM in my current role as an Electric Vehicle Integration Engineer. I use what I learned during my fellowship year in my role today to think about equitable access to electric mobility options that meet existing community needs. I also continue to “Lead” and “Give” by coaching and mentoring all-girls robotics teams in Southwest Detroit. This year in partnership with the Mercy Education Project and the Detroit Hispanic Development Corporation we launched a middle school team. This team completes our progression of FIRST robotics programs from elementary through high school for girls in Southwest Detroit. QUESTION: Roy, tell us about your career and educational pursuits, and how you continue to carry what you learned during your fellowship in your work today. ROY: I aspire to work for an economic development fund in an underserved city, after a learning as much as possible within investment banking. Moreover, my long-term goal is to start my own investment fund.I decided to pursue my MBA because I wanted to pivot from a manufacturing finance role into a strategic investing role focused on mobility and the changes expected to impact our society because of these different mobility services (Uber, Lyft, Waymo, GM Cruise, etc …). As a fellow, I was able to polish my interviewing/information gathering and presentation skills, which I hope to employ as I continue to educate myself about the mobility space as our society starts to introduce mobility as a service. As an investment banking associate for the summer, I hope to use my improved presentation skills to present a cohesive story, based off the data/financials available, to potential clients and stakeholders. QUESTION: Jocelyn and Kristelle, as current Fellows, tell us about some of your favorite ways to explore and “play” in Detroit. 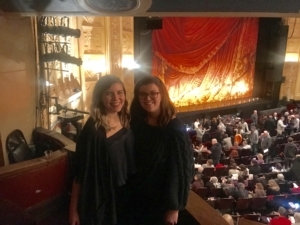 Rachael and Jocelyn attend an event at the Detroit Opera House. JOCELYN: Moving to Detroit was fun for me, because in addition to being able to find friends in my amazing cohort, I also get to join in to Rachael’s circle here. She was definitely a bit of a tour guide for my first couple of months as I figured out my go-to places. Now, I have a go-to coffee shop (Dilla’s Doughnuts across the street from the Opera House) and a go-to take out order (Any pizza place that will make me a chicken parmesan sandwich), but it’s still fun that we get to explore the new businesses opening up around the city together. “Playing” in Detroit is different from any city I have lived in because there is so much development happening right now. You can always find a new place to try for food or shopping. Additionally, one of my favorite facts about Detroit (that I actually learned during the Challenge Detroit Interview trip!) is that it is home to the second largest theatre district in the country outside of New York. It has been so exciting to get to experience theatre in a variety of capacities in the city—from my own work seeing opera and dance at the Detroit Opera House, to the amazing Broadway shows at the Fox and Fisher Theatres, to improv at Planet Ant, and plays at the Detroit Repertory Theatre. There is a huge variety of performance types and opportunities to see theatre at discounted prices. I feel really lucky to be an artist in a city where there is so much art available and accessible for everyone. KRISTELLE: I never realized how much there was to do in Detroit before moving here. Living downtown, I have been able to do things such as ice skate at Campus Martius and try different restaurants unique to the city of Detroit. I also have spent a lot of my time in the newly built Detroit City Club Field house playing soccer and making new friends with other young and emerging professionals in Detroit. QUESTION: For each of you, how do you hope to continue playing a role in Detroit in the future? JOCELYN: In my own small way, I hope to benefit the Detroit arts community moving forward not just at work but in my free time as well. I joined the Detroit Passport to the Arts Board (along with a whole group of past fellows and current fellow, Zack Baker). On the DP2A Board, members work to sustain a network of young professional arts lovers in the city and connect them with opportunities to engage with local art venues in the city. Furthermore, Rachael and I have been lucky to live all of the Challenge Detroit pillars here together this year. One of the best parts of that experience has been the fact that we have a network of people in the city that we have built that lets us continue to be active and impact Detroit. This has meant everything from supporting our friends who are building and working in local businesses with our patronage to joining local soccer leagues and attending Detroiter-lead events. Part of playing a role in Detroit for us has been living the fullest experience we can in the city and continuing to speak highly of all the people who are doing amazing work here to impact the community. KRISTELLE: I hope to continue to teach people and encourage them to explore the city, because there really is so much that it has to offer. I also hope I can volunteer more especially with kids sport’s teams to keep encouraging the youth to be active. I am looking forward to the nice weather and to all the festivals and events that are coming to Detroit. ROY: My long-term goal is to start an investment fund in the city of Detroit and potentially run for mayor.